Republicans storm to power in the U.S. Senate, extend their majority in the House of Representatives and put a series of Democratic-leaning states under control of Republican governors in a clear repudiation of President Barack Obama. Republicans stormed to power in the U.S. Senate, extended their majority in the House of Representatives and put a series of Democratic-leaning states under control of Republican governors in a midterm election that was a clear repudiation of President Barack Obama. The vote gives Republicans momentum heading into the 2016 presidential race, which now becomes the focus of American politics for the next two years. At issue now is whether Obama, his congressional Democrats and the newly robust Republican majorities will be able to break the legislative gridlock that has gripped the U.S. capital in recent years. The president scheduled a news conference for later Wednesday to offer his take on an Election Day thumping of his Democratic Party. It's a political low point for a president who electrified the world with his election in 2008 as the first African-American president and was comfortably re-elected in 2012. Though he saw Democrats lose the House in 2010, partly in a backlash to his health care overhaul, this will be the first time he must also deal with a Republican-led Senate. Heading into the vote, polls showed Republicans in line to pick up the six Senate seats they needed for a majority. They snatched away at least seven, giving them at least 52 seats in the 100-member Senate. Republican gains could continue. In Alaska, Democratic Sen. Mark Begich was trailing Republican Dan Sullivan, and Louisiana is headed for a Dec. 6 runoff after no candidate won a majority. In a further sign of Democratic woes, the Republican candidate still has not conceded defeat in Virginia, where Democrat incumbent Mark Warner garnered just a one-point advantage. His Republican challenger still might call for a recount. Republicans had made Obama's presidency the core issue of their campaigns, even though he wasn't on the ballot. They tapped into a well of discouragement at a time many Americans are upset with a sluggish economic recovery and are besieged by troubling news, such as the spread of Ebola and the rapid rise of ISIS militants in Iraq and Syria. Nearly two-thirds of voters interviewed after casting ballots said the U.S. was seriously on the wrong track. Only about 30 per cent said the U.S. was headed in the right direction. "It's a reflection of the president's lack of leadership, his lack of leadership abroad, his lack of leadership at home," said Republican New Jersey Gov. Chris Christie, a possible presidential contender who campaigned for Republican candidates across the U.S.
Democrats had few bright spots. New Hampshire Sen. Jeanne Shaheen and Gov. 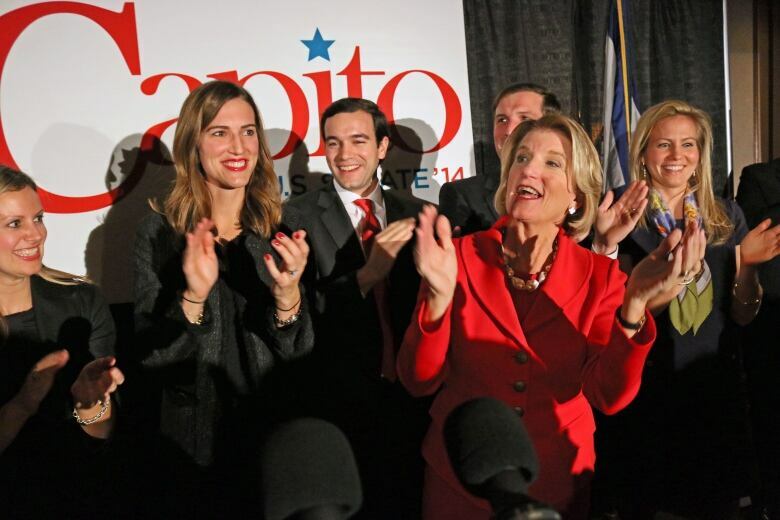 Maggie Hassan, who campaigned with potential 2016 candidate Hillary Rodham Clinton last weekend, both won re-election. 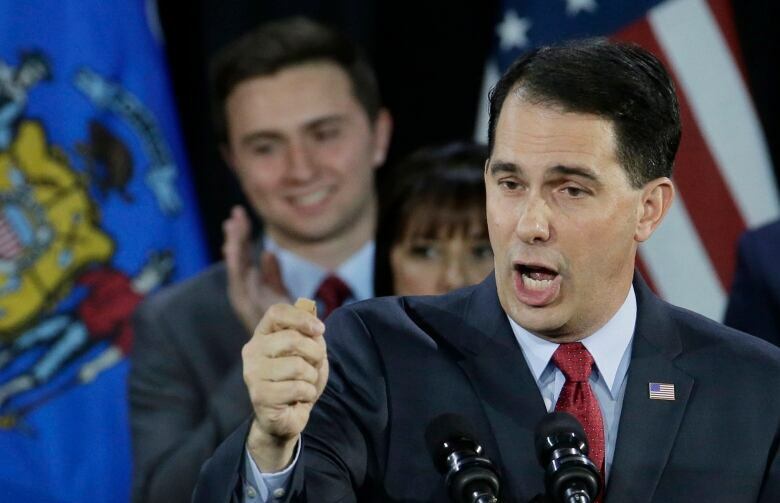 In Pennsylvania, businessman Tom Wolf dispatched Republican Gov. Tom Corbett. In state capitols, Republicans were poised to leave their imprint, picking up governors' seats in reliably Democratic states like Illinois, Maryland and Massachusetts. Republicans were especially encouraged by victories in battleground states that can sway presidential races, such as Florida and Ohio. In the House, Republicans were on track to meet or exceed the 246 seats they held during Democrat President Harry S. Truman's administration more than 60 years ago. "We are humbled by the responsibility the American people have placed with us, but this is not a time for celebration," said House Speaker John Boehner. "It's time for government to start getting results and implementing solutions to the challenges facing our country, starting with our still-struggling economy." More than four in 10 voters disapproved of both Obama and Congress, according to the exit polls conducted for The Associated Press and the television networks. 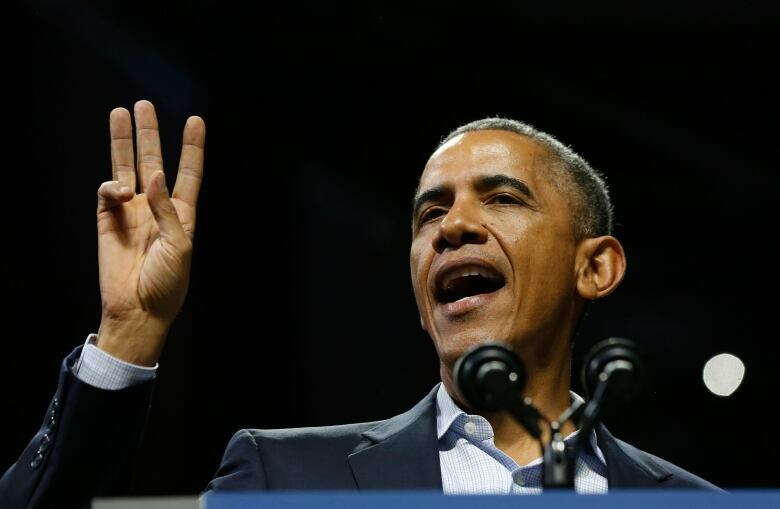 Obama's poor approval ratings turned him into a liability for Democrats seeking re-election. The outcome offered parallels to the final midterm election of Republican George W. Bush's presidency, when Democrats won sweeping victories amid voter discontent with the wars in Iraq and Afghanistan. In one of the more closely watched contests, Senate Republican leader Mitch McConnell won re-election in Kentucky, likely elevating him to become the new Senate majority leader. McConnell has been a severe critic of Obama, but has also helped broker bipartisan deals that ended last year's government shutdown and twice averted federal default. Voters are "hungry for new leadership. They want a reason to be hopeful," McConnell said in a gracious victory speech that commended Grimes for running a good race. One of Obama's first post-election calls was to McConnell. The two didn't connect, but Obama left a message for the senator. A Republican also gained a seat vacated by a retiring Democrat in Iowa — the state that set Obama on course for his first presidential victory in 2008. 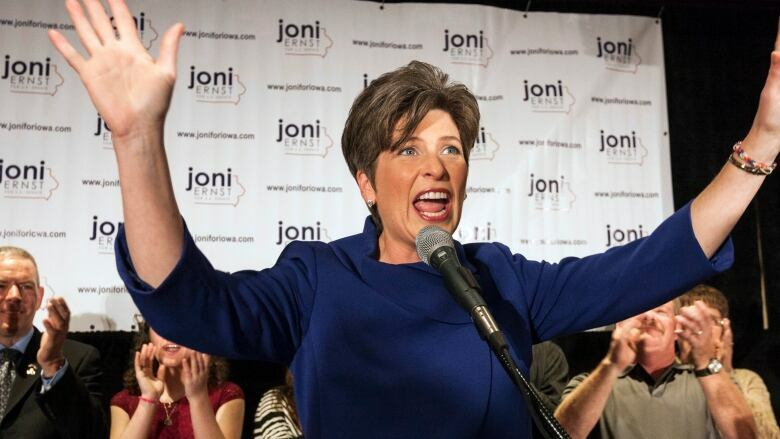 "Thanks to you, Iowa, we are headed to Washington, and we are going to make them squeal," declared Iowa Republican Joni Ernst, who vowed to cut pork in Washington in television ads that memorably cited her growing up castrating hogs. In the House, only a few dozen races were truly competitive. But in a sign of the depth of voter displeasure, Democrats could not even beat Republican Michael Grimm, a New York congressman indicted on tax fraud and other charges. He gained national fame by threatening to throw a reporter off a balcony in Congress.